South Korea and the United States signed a provisional agreement Sunday on the sharing of costs to maintain US troops here, with South Korea raising its share by 8.2 percent. 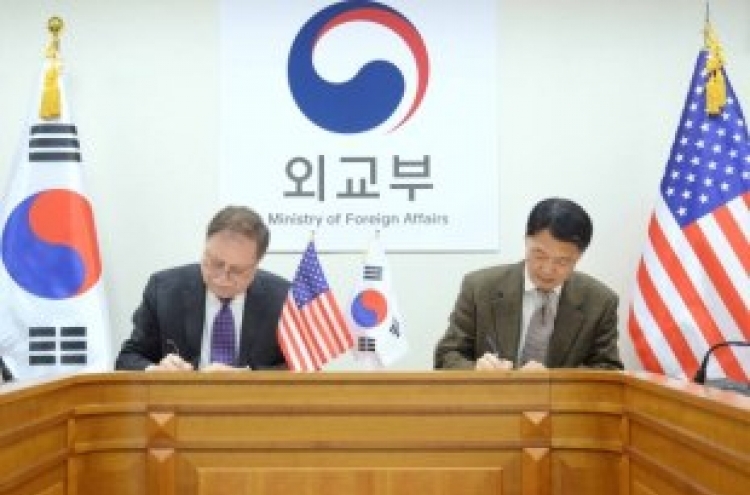 Seoul’s negotiator, Chang Won-sam, and his US counterpart, Timothy Betts, met in Seoul to ink the contract. Under the new deal, South Korea will pay about 1.03 trillion won ($890 million) to cover the costs of stationing the 28,500 members of US Forces Korea here throughout 2019. The figure reflects the rate of increase of South Korea’s annual defense budget, according to the Foreign Ministry in Seoul. Last year, South Korea paid about 960 billion won to its ally for the same purpose. Upon Washington’s request, the contract will be valid only for one year instead of five, unlike in previous years. The renewal of the Special Measures Agreement between the allies comes after the expiration of the previous deal Dec. 31. While negotiations began in March 2018, the two sides had been at odds over the duration of the agreement and the amount to be paid. The last deal was sealed in early 2014, having missed the original 2013 deadline. Before signing the pact Sunday, US negotiator Timothy Betts met with South Korean Foreign Minister Kang Kyung-wha. “We were able to close the gap on the total amount of the number (cost), and that I think is due to the goodwill and the trust that the two sides have built over the past years,” Kang said. For the renewal of the pact, Seoul had previously insisted that the costs to be borne by South Korea not exceed 1 trillion won and that the deal remain valid for three to five years. But with US President Donald Trump calling for his allies to pay an increased share of their defense costs, South Korea was under pressure to pay almost double the current amount, equivalent to nearly $1.4 billion a year. Over multiple rounds of talks held last year, the US compromised on the amount, but the US maintained that the deal should be valid for only a year. Having kept the amount close to the 1 trillion won line, Seoul’s Foreign Ministry called the final deal a win-win pact, but concerns persist here that costs could rise every year through annual negotiations. US lawmakers had also urged the US to seek a longer-term cost-sharing agreement for the stationing of troops here. US Reps. Grace Meng and Norma Torres wrote to Secretary of State Mike Pompeo on Wednesday, saying the one-year deal did not sufficiently reflect the importance of the US alliance with South Korea. When the negotiations began last year, Washington had asked South Korea to finance “operational support” that would have covered the deployment of strategic assets, an official from the Foreign Ministry here explained. But Seoul continued to reject that condition, saying it was not part of the deal’s purpose, and the US side retracted the proposal. The ministry official also said the two sides could possibly extend the pact beyond a year, if they fail to reach an agreement before the deadline. Upon review from the presidential office and the Legislation Ministry, the tentative pact is expected to be submitted to the National Assembly for approval sometime around April, before it can take effect. The two allies signed their first SMA in 1991, and the deal has been renewed intermittently since. The funds are spent for the construction of US military facilities, to pay for South Korean civilians working at the military posts and for logistical support. The agreement comes weeks before Trump is set to hold a second summit with North Korean leader Kim Jong-un in Hanoi, Vietnam, Feb. 27.